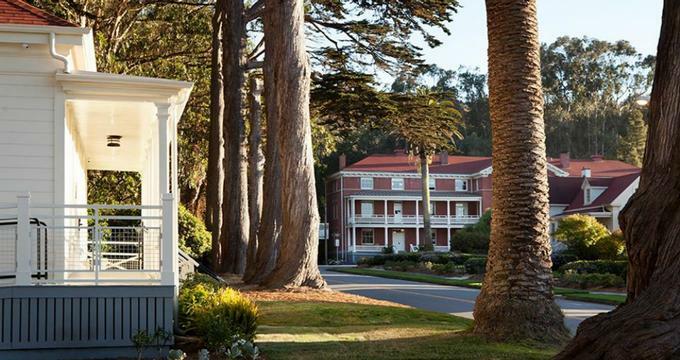 Located in the heart of the national park site of the Presidio of San Francisco, the Inn at the Presidio offers an authentic historical experience and alternative San Francisco lodging experience. Surrounded by the breathtaking natural scenery, networks of hiking trails and other exceptional recreational opportunities in a beautiful setting, the historic boutique hotel is located at Pershing Hall. Set in a magnificent Georgian Revival-style building, which has been lovingly restored to its former glory to become a boutique hotel, the Inn features well-appointed and stylishly decorated guest rooms and suites with fireplaces and private bathrooms. The Inn also offers luxury amenities, modern spaces for meetings and other events and is within proximity to several of the area’s most popular attractions such as the Golden Gate Bridge, Union Square, the Ferry Building, and the Marin Headlands. The alluring Sonoma and Napa Valley wine country is a short drive away. The Inn at the Presidio features 22 beautifully appointed and stylishly decorated guest rooms and suites located in the Inn’s main building and a restored Victorian house nearby. Accommodations boast vibrant country décor and antique furnishings with distinctive artisan details and memorabilia that echo the history of the hotel's rich past and offer a breathtaking view of the surrounding Presidio. The main building of the Inn features three floors of guest rooms and suites, with an additional level of flexible spaces and meeting rooms for events and functions. The beautiful Victorian-style Funston House is just steps from the main building and houses four private and quiet guest rooms, as well as a spacious communal living room, elegant dining room, and outdoor porch and patio with rocking chairs. Guest rooms and suite feature king, queen or double EuroTop beds by Restonic with pillowtop mattresses, luxury linens and hypoallergenic pillows, and en-suite bathrooms with walk-in showers soaking tubs, fresh towels and bathrobes, and EO bath products. Separate spacious sitting areas have queen-size pullout sleeper sofas and comfy armchairs, work desks with chairs, gas fireplaces and large windows that embrace beautiful views. Deluxe amenities in both guest rooms and suites include flat screen televisions with cable channels and MP3 docking stations, coffeemakers, mini-fridges, and tea kettles (upon request), direct dial telephones with voicemail services, hair dryers, irons and ironing boards, and complimentary wireless Internet. Additional guest services include daily housekeeping, daily newspaper delivery, and in-room massages available with prior booking. A complimentary gourmet breakfast is included in the stay and served in the elegant dining room every morning. Breakfast delights include freshly brewed coffee and tea, fresh fruit juices and fruit, cereals and homemade granola, yogurt, baked bread and other goods, eggs dishes and more. In the evenings, the Inn hosts wine-and-cheese receptions where guests can gather to taste some of the Sonoma and Napa Valley’s best wines and socialize. Luxury amenities at the Inn at the Presidio include a delicious continental breakfast served in the sunny dining room every morning, evening wine-and-cheese receptions where guests can gather to taste some of the Sonoma and Napa Valley’s best wines, and a complimentary shuttle service around the Presidio. The Inn features an outdoor deck with a fire pit, and a porch with rocking chairs where guests can kick back and relax with a glass of wine and savor the fresh sea breezes and modern business center with computer and printing and copying services is also available. Additional guest services include daily housekeeping, daily newspaper delivery, and in-room massages available with prior booking. The Presidio of San Francisco offers much to do in the way of attractions and activities, from museums, art galleries, restaurants, cafés and bars to endless walking and hiking trails, mountain biking, swimming, horseback riding and more. Surrounding the southern entrance to the port of San Francisco, the Presidio is within a short drive to the city’s main attractions such as the Golden Gate Bridge, Fisherman's Wharf, the golden sands of North Beach, and myriad little neighborhoods with some of the region’s best food and shopping. The Inn at the Presidio offers an ideal location for events and meetings with two, 425 square-foot meeting spaces located in the main building that can accommodate up to 20 attendees. Presidio meeting planners are on hand to take care of all the details, and catering options are available if required.